"We must search quickly for our princess and protect the galaxy from the evil hand of Sailor Galaxia... To do that, we've become idols, we've become high school students, and we've become boys..."
snaps in the night. a shooting star flows across the sky. is it a bird? is it a plane? heck no. its the sailorstarlights! primarily, sailorstarfighter! this mysterious character appeared just as many times as seiya kou did, if not more. starfighter, being much more serious of a character than seiya, seems to hold a similar priority as uranus and neptune did, along with the other two starlights. duty : find the princess, save the world from galaxia. of course, starfighter's mission was intercepted, mainly because of all the fowl-ups created by galaxia's minions. 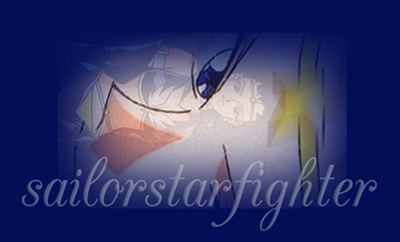 the starlights worked co-incidedly with the senshi... at times. as if this new earthly life wasn't complicated enough, things worsened when the identities of the senshi were revealed to the starlights, and vice versa. starfighter's now boy-like heart fell for usagi hard, and now that she knows the truth about usagi's identity, it would be hard for them to truly be together at all... as both civilian OR senshi.